I must have started and re-started this post about a dozen times since I found out the news earlier today, and still can’t find the right words, so I’ll keep it short. My deepest condolences to their family. It’s all getting just a little freaky here thanks to the very strange Mike Stone and the equally, if not more so, strange Cate Gardner, and the possibly stranger still, Strange Publications. What a weird bunch of reprobates they are. 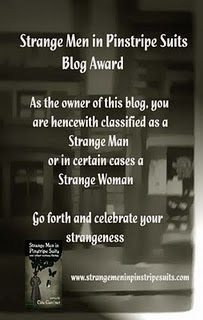 For some obscure reason beyond my ken, I’ve been included in all this random surrealism and hereby nominate anyone strange enough to visit my small, dark niche of the web to be equally embraced. That means you, yes you, and especially you there at the back. Check out the weirdness here.